Adding email addresses to the negative list will prevent the possibility of duplicate contact creating in TeamWave. There might be the possibility of duplicate contact creation if there are multiple email addresses in a forwarded email and you have a Sales automation rule associated with just one email address. 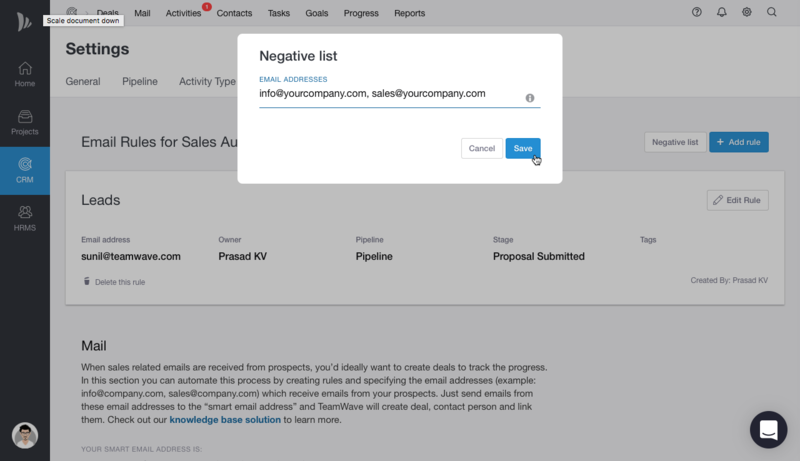 You can prevent duplicate contact creation simply by adding them in Negative List. Suppose there are multiple email ids like info@yourcompany, sales@yourcompany etc in a forwarded mail to which are associated with a rule. Since TeamWave will create contacts with new email addresses found in forwarded emails, there could be duplicate contacts for info@yourcompany, sales@yourcompany. For example, If your employee's email ids are added to the negative list, these will be automatically ignored while creating contact persons.